First suggested by Sir Thomas Lewis (1881-1945) to better observe the fibrillatory waves in atrial fibrillation. Also named as S5 lead. Lewis modification does not involve the standard precordial leads (V1 to V6). How is Lewis lead recorded? Right Arm (RA) electrode is placed at the 2nd intercostal space, on the right border of the sternum. Left Arm (LA) electrode is placed at the 4th intercostal space, on the right border of the sternum. The leg electrodes may be left on the ankles or may be placed at the similar sides of the lower abdomen. Adjusting the ECG calibration to 20mm/mV will help to highlight the atrial activity. When do we use Lewis lead? 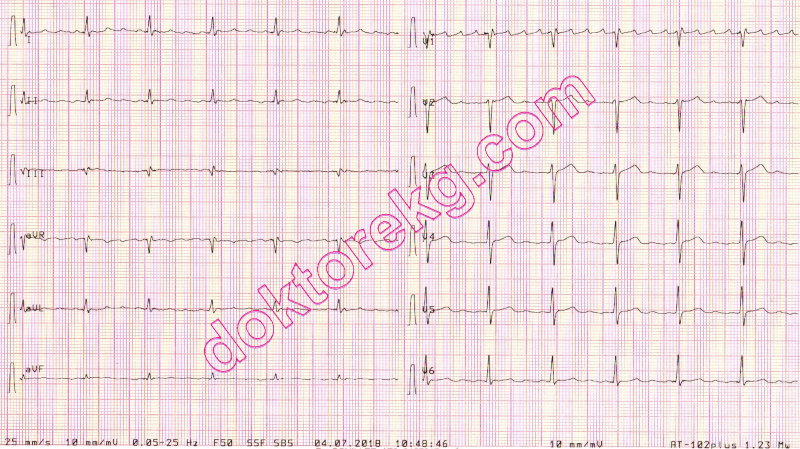 To see the flutter waves during atrial flutter. To see the P waves (if present) during wide QRS complex tachycardia (WCT). P wave is looked for the detection of AV dissociation during WCT. AV dissociation during WCT suggests the diagnosis of ventricular tachycardia. With standard electrode placement, P waves (AV dissociation) are seen in less than half of the VT cases. Highlighting the atrial activity by S5 electrode may ease the differential diagnosis of WCT. J Emerg Med 2012;43:e97-9. doi: 10.1016/j.jemermed.2009.08.057. Figure 1a. Lewis lead placement is shown above. The feet electrodes may be left at the feet or may be moved to the lower abdomen of the same sides. Lewis modification does not involve the standard chest leads (V1 to V6). Figure 1b. Placement of chest electrodes during standard 12 lead ECG acquisition. V1 is placed at the 4th intercostal space and at the right border of the sternum. Midclavicular line is shown with blue. ECG 1a. The ECG above belongs to a 74 years-old man with chronic atrial flutter. He does not have heart failure. Normal electrode placement shows prominent flutter waves only in lead V1. ECG 1b. The ECG above belongs to the same patient. It was recorded after Lewis modification. Now, prominent flutter waves are seen in leads I, III, aVL and aVF.